The first sponsored ad on mobile was created by a Finnish news provider in 2000, sending news headlines through SMS. From those humble beginnings seventeen years ago, mobile ads are now a $101 billion market, accounting for 60% of all digital ad spend. Despite the massive size and years of history, mobile advertising is unique, and still evolving. That’s because of games: almost half of all time spent on smartphones goes into playing games, with the average adult in the US spending 23 minutes a day on mobile gaming. And addressing this massive market of gamers isn’t as easy as past markets like TV or radio. Each combination of platform (iOS or Android) plus country has its own profile of how mobile gamers interact with ads and spend on products. For user acquisition managers, knowing how to best leverage new channels and emerging markets are some of the key drivers of success. We looked at the Chartboost network of 1 billion monthly active players to find the countries with the highest 7 day ROI percentage – uncovering the emerging countries where recouping your investment per user is the highest. Out of 160+ countries in our network, only tiny Switzerland ranks as a top country for return on investment in both iOS and Android. The importance of this fact can’t be overstated: in each country, either iOS or Android (but not both!) tends to offer the highest quality users acquired through ads. This is a result not only of the varying penetration rates of iOS or Android in each country, but also of the demographic that is adopting each. 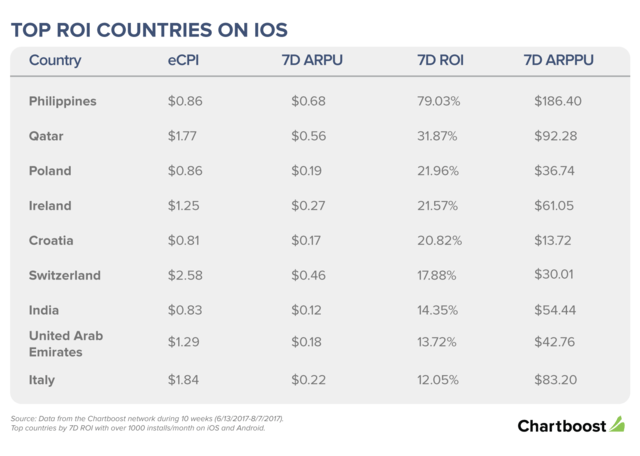 Android may be blowing past Apple in number of users in India, for instance, but a $54 average revenue in 7 days per paying user (7D ARPPU) on iOS in that country means that Apple users are spending more. 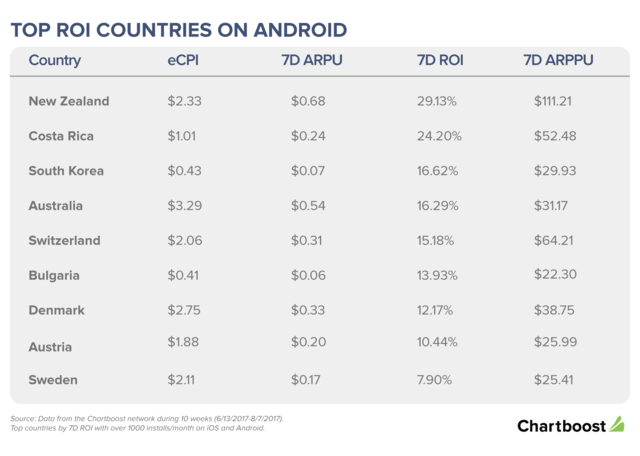 While many Western European and English speaking countries offer the highest Android ROI, we are seeing emerging markets on top of iOS. This sounds counterintuitive at first: shouldn’t the highest-spending users come from the richest countries? The answer is generally, “yes”, but you also pay more for these high-spending users, so the ROI is lower. Meanwhile, users who can afford iOS devices in emerging countries are still relatively rich, but can be acquired more cheaply due to their location. High ROI isn’t always the result of a lot of users paying for in-app purchases. For instance, a low bidding cost is what drives ROI in India and Croatia, despite a relatively unimpressive average revenue from paying users. Depending on your goals, quantity really can be as good as quality. The 7 day ARPPU of iOS users in the Philippines is $186.40. This is a surprising number even to companies that have acquired Filipino users before: often the assumption is that certain developing countries are only good for massive volume or testing purposes. It’s true that few users convert to paying in the Philippines (and many other developing countries), but those that do are truly golden needles in the haystack. Hopefully, the above concepts have given the grounding you need to look at the below data on the top 10 countries each for iOS and Android. The focus is on ROI, and savvy advertisers will use this fact to their advantage. Below, eCPI means effective cost per install, the 7D ARPU is average revenue per user over one week, and 7D ARPPU is the revenue per paying user over a week. For many app, game and media advertisers, tried and true markets — particularly those that speak English — remain the primary focus. As our learnings and data show, this is no longer a valid assumption to make. Around the world, many markets have become valuable, with users who can provide the ROI to justify advertising efforts. Pepe Agell is the VP of Corporate Strategy at Chartboost, the leading mobile gaming audience network. Learn more at Chartboost.com. 7D ROI: Percentage of the 7D ARPU/eCPI of that country, which indicates how much of the cost per user is recouped in the first 7days.